Hard to believe we are flying through October and Halloween is almost here. As the nights get shorter and the fires burn hotter it only makes me want to hang on to the fall harvest that much more. The fall brings such wonderful colors and textures and I can’t wait to try each and every one. For this edition I bring you the super sweet, super gorgeous Concord grape. The little seeds inside don’t bother me at all. 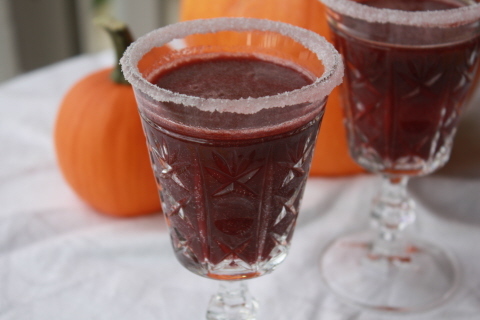 These little fall gems are magnificent at satisfying a sweet tooth, and make a slightly spooky non-alcoholic cocktail. October has been a crazy month of traveling and things are just getting back to normal. Please don’t take my absence as anything personal. It certainly is nothing more than a much needed break. 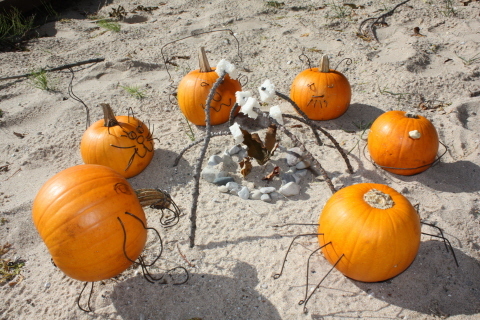 First, we were at Crystal Lake MI where we made these incredibly cute pumpkins. This is a super easy craft and used left over wire and some little pumpkins. That’s it! The project was enjoyed by all, and we were amazed what you can do with some pumpkins, wire, wasabi peas, and a LOT of creativity. I would like to remind you to Just Eat Food, but make sure to play with it first. Wishing you all a safe and Happy Halloween! This was an experiment but turned out to be pretty tasty. Want some fizzies without fake sweeteners? This is the treat for you. My aspartame loving husband even liked it (doesn’t mean much because he likes everything I make don’t you sweetest?). So, try it for yourself. Last winter I made Grapefruit Soda, which was great too. This is the perfect way to cut the sweetness of juice and get some fuzzy little bubbles too. If you don’t want to mess with juicing the grapes you could use an all natural grape juice which would be lovely too. For each serving use (2) parts grape juice to (1) part sparkling water. *If you have a juicer use that to extract the juice from the grapes. I had to use a food processor and then strain the seeds and skins from the juice. Kind of laborious but the results were worth it.